Where to eat tonight? Tomorrow? Next week? Next summer? By the sea, in the city, the country or in that little place round the corner? Leave it to The Good Food Guide by Waitrose & Partners, Britain’s number one restaurant handbook, to help you decide. This trustworthy dining companion, a reassuring presence in the nation’s bookcases and glove boxes since 1951, seeks out the cream of restaurants, pubs and cafés across the UK, from big names to best-kept secrets, from budget eats to destination dining. And now, as well as The Good Food Guide book, myWaitrose members can access the full online review content for free at thegoodfoodguide.co.uk. Simply sign up using your myWaitrose number and browse more than 1,200 reviews of the UK's best restaurants. You'll be able to bookmark your favourites, share reviews with friends and reserve a table direct from the website. Plus, read interviews with top chefs, catch up with exciting foodie trends, and find out which restaurants are the ones inspectors can’t wait to revisit – and which dishes really set their hearts racing. Our experienced inspectors dine anonymously and pay the bill in full. Their authoritative and entertaining write-ups take account of feedback from thousands of regular diners whose voices keep The Good Food Guide fresh and free from bias. When we award our highest score, a perfect 10, it matters. 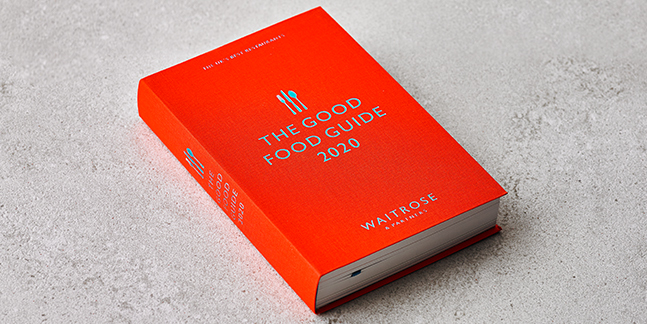 Buy The Good Food Guide 2019 in Waitrose branches from 6 September, rrp £17.99. Visit thegoodfoodguide.co.uk for chef interviews, restaurant news and access to all of The Good Food Guide's reviews.